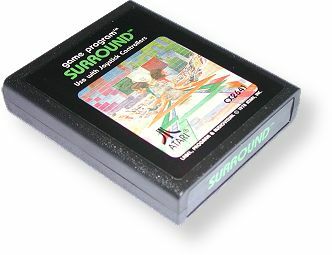 Perhaps the most common Atari label style, Picture labels were introduced in 1981, replacing the older text labels and were used throughout the remainder of the 2600's lifespan. They feature the same font as the Text label, but feature a game-related picture in the middle of the label. The end label simply states the game's name, and there is no border around either the main or end label. Many picture label titles also have text counterparts, and there are a few other anomalies as well (Silver Asteroids, Red Space Invaders and Yars' Revenge).